One hundred years ago on 31 May and 1 June 1916, 250 ships of the British and German navies fought an abortive action in the North Sea off the coast of Denmark—the only direct encounter of the two battle fleets during the entire First World War. It resulted in the catastrophic sinking of three British battle cruisers, and uncertainty and confusion amongst the commanders and individual formations and units on both sides. 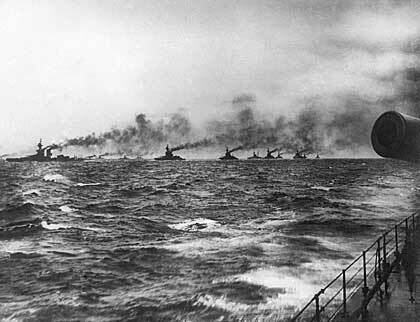 Jutland cost the lives of 8,645 men serving with Royal Navy and the German High Sea Fleet. The beginning of the battle saw the British Grand Fleet succeed in interposing itself between the German High Sea Fleet and its bases, but later lost that position, unknowingly, as the Germans broke through the light forces in the rear of the British formations overnight. A series of ferocious encounters ensued, but the German movement through the rear was never reported to the British commander, Admiral John Jellicoe. When 1 June dawned, the Grand Fleet was left with an empty horizon as the Germans withdrew. Three British battle cruisers and 11 other ships had been sunk, while the Germans’ smaller High Sea Fleet had lost only a battle cruiser, an old pre-dreadnought battleship and nine other vessels. Britain and the Royal Navy mourned Jutland. The legacy of the battle was ‘never again’. There was regret for tactical and material failures and the catastrophic losses they caused, regret for the deficiencies of reporting and communications and, above all, regret for the absence of initiative on the part of so many who should have known better. That collective attitude mattered, for what’s notable about Jutland was the presence at the battle of the Royal Navy’s future leadership. Only one First Sea Lord between 1916 and 1943 was not at Jutland. This continued beyond the Second World War. The commander of the Commonwealth naval forces off Korea in 1950–51 had been a midshipman at Jutland. The First Sea Lord from 1951 to 1955 was at Jutland as a Lieutenant in the Malaya. The statistics for the other naval members of the Board of Admiralty are almost as telling. Gunnery officer Guy Royle on the battleship Marlborough—who would later serve as Fifth Sea Lord and then head the Royal Australian Navy between 1941 and 1945—always felt that he should have engaged the target that he saw at night from the gun control position of the Marlborough without seeking permission from his captain. The latter assumed that the ship looming up in the darkness was friendly—but it was a damaged German battle cruiser, which soon disappeared in the gloom. In later years, there may have been ‘too much Jutland’. Yet it’s clear that the Royal Navy between 1916 and 1939 functioned in relation to the battle as a ‘learning organisation’. The immediate response to the Grand Fleet’s material problems was remarkable, and a tribute to at least one facet of Jellicoe’s leadership. However, to suggest that command and control moved to a looser regime, particularly after Admiral David Beatty, formerly in charge of the battle cruisers, took over as C-in-C in November 1916 over-simplifies what happened. Many problems remained and had to be endured. Jutland confirmed that the battle fleet (at some 30 battleships) was too big. Given the forces available on either side, however, the North Sea battle fleets would always be larger than tactically desirable. There was a new emphasis on squadron and divisional tactics and a greater understanding that subordinate flag officers needed the authority to respond individually to an emerging situation. But it’s notable that the drive within squadrons and divisions was to an even greater degree of coordinated manoeuvre, not less. The reason was that concentration of fire became a focus of gunnery innovation, first with two ships and then up to four as a single gunnery ‘unit’. Night fighting was the subject of new attention, with the realisation that the uncertainty of combat in the darkness could only be mitigated by the development and practice of procedures and tactics understood by all, and initiated automatically, without waiting on direction from the formation commander. Before Jutland, the Grand Fleet’s reactive attitude to action in the dark—and the doctrine and training which resulted—had been based on the assessment that a night encounter with no warning in the open sea was impossible. There was good reason for that given the difficulty of ships finding each other at night. However, any North Sea fleet encounter that started after noon would inevitably continue into a night action, particularly when it wasn’t high summer. After June 1916, the Grand Fleet understood this. Control and precision were emphasised in another area—reporting the enemy. By 1918, detailed analysis was being produced in the wake of each major Grand Fleet tactical exercise. That not only set out what had happened, but critiqued formation commanders and individual ships. It also included an annex which listed and assessed every reporting signal—and pointed out when signals should’ve been sent, but weren’t. Keeping one’s head below the transmission parapet was no longer acceptable, particularly in a scouting unit. The years that followed the Armistice would be difficult for the Royal Navy, marked as they were by an increasingly onerous ‘peace dividend’, as well an unfortunate controversy over the relative performance of the main British commanders at Jutland. Nevertheless, the seeds of change were already sown.